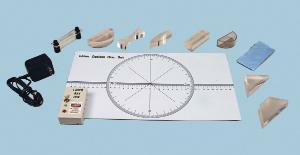 This is an excellent and economical set for introductory ray optics. 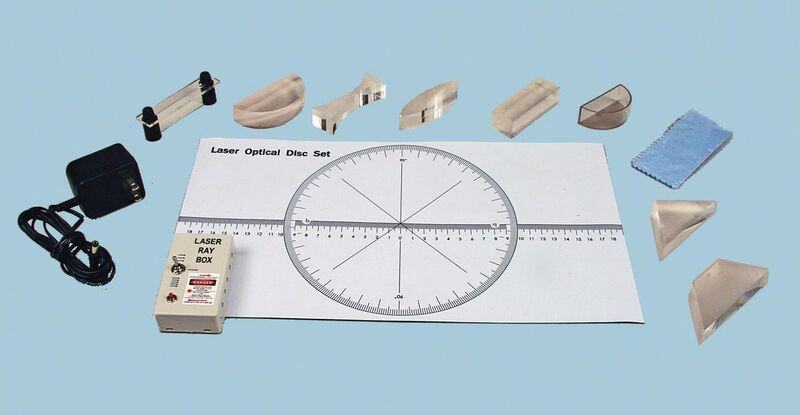 A vinyl template with a degree circle and a linear scale forms the optical disk, and the set includes seven clear acrylic optical elements and a mirror with adjustable curvature for investigating refraction, lenses, prisms and mirrors. Please note: This product emits laser light. Max. output power <1 mW per beam. Wavelength 650 nm. Class IIIa laser product. Ordering information: Contents include Wall-mount Power Supply, Laser Ray Box (1, 3, or 5 rays), Parallel-sided Block, Trapezoidal Prism, Right Angle Prism, Biconcave Lens, Biconvex Lens, Semicircular Lens (solid), Semicircular Cell, Flexible Template—ruler and protractor, Adjustable Mirror—plane/concave/convex, Aluminum Storage Case, and Activity Guide.